I’m a flower person. I love all kinds of flowers in all different colors and I especially like having fresh ones at my own place. If you want to treat yourself or somebody else (be aware that it’s not cheap!) with a crafty hand-tied bouquet, Blumenkraft is a great option. It’s by far one of the fanciest and most aesthetic flower shops you’ll find around town. Blumenkraft, which translated into English means ‘flower power’, welcomes you with four big bow shop windows. Once you’ve entered you’ll find yourself in a spacious opening with high ceilings and a reductive overall design. The power of the flower does come on strongly, as the spotlight lies solely on the flowers themselves. All of them are precisely picked and elegantly displayed in big vases. 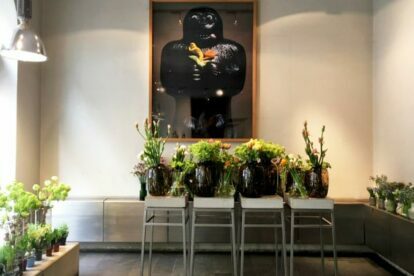 The design of the vases changes regularly and so do the lavish artworks on both sides of the store, which are an eye-catcher as well. Be prepared to fall in love with each and every flower. If you are into delicate architecture, pay close attention to the back part of the space with the white steel pillars, the stucco on the ceiling and the ornate windows that add up to the overall classy feeling.